Greystone Luxury Apartments in Gainesville, Florida, are located just one and a half blocks from the University of Florida campus and offer studios to 4 bedroom apartments and townhouses. The location of these apartments is hard to beat! Amenities vary by floorplan with many units having oversized balconies, petrified wood floors, elevated ceilings, built-in bookcases, and art nooks in the living room. Every apartment includes an oversized living area, gourmet kitchen with granite countertops, and master bedroom with luxury bathroom. The gourmet kitchen includes granite countertops, elevated breakfast bar, custom wood cabinetry, upgraded appliances, and built-in wine rack. Hi-speed Ethernet ports are available in each bedroom and activated prior to move-in with the FASTEST internet in Gainesville-- 65x faster than the Cox Essential Internet package! Not only are these units packed with luxury amenities, they are located 1.5 blocks away from UF campus and 2 blocks away from Sorority Row, so you can skip the bus and walk to class or your sorority. Relax on the balcony and read a book or drink your morning coffee as some of the units include a porch swing. 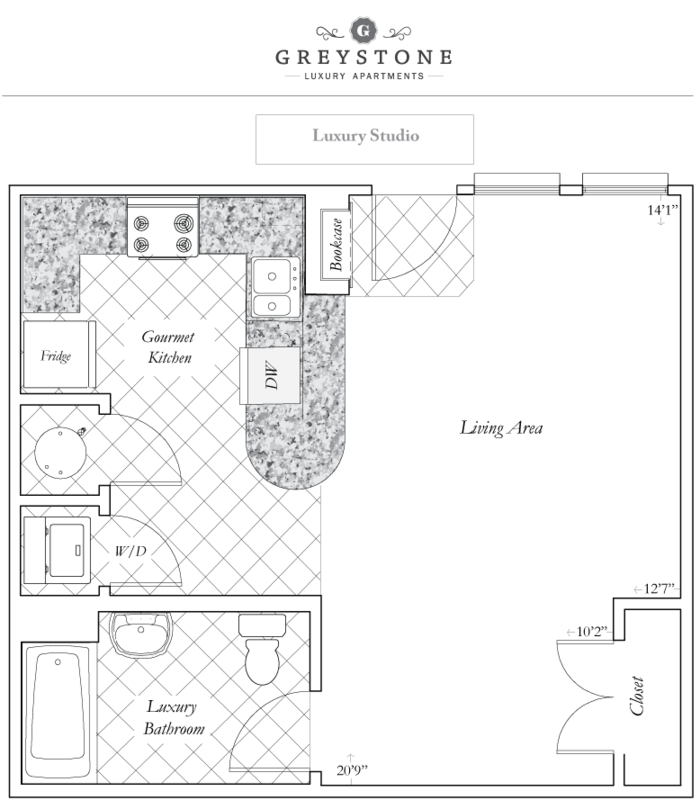 Greystone Luxury Apartments is located and 0.41 miles from University of Florida. The property has a Walkscore of 54, so you might need to drive or bike some of the time. Greystone Luxury Apartments has many shops nearby. Coffee shops in the area include Starbucks, Lollicup, Volta Coffee, Tea & Chocolate. There are a number of markets in the area include Walmart, Publix Super Market at Esplanade At Butler Plaza, Publix Super Market at West Gate Shopping Center.